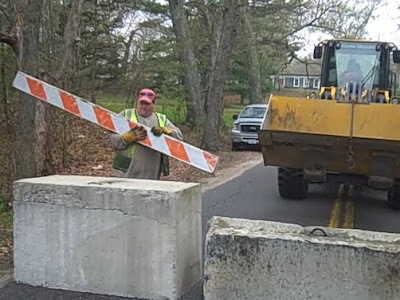 Town officials Friday afternoon shut down a 20-foot-long bridge on South Road just east of Route 2 after discovering that its support structure had rotted and its road surface had dropped two to three inches. The state Department of Transportation inspected the bridge Friday afternoon and agreed to the town's decision to shut it down. Concrete blocks were placed at either end of the bridge by mid-afternoon Friday. Public Works Director Joseph C. Duarte said the steel and concrete bridge, which goes over the Hunt River, will be closed indefinitely. "It's got to be repaired, which will take months and months," he said. The bridge is on a town road, so the town will be responsible for fixing it, he said. The town received a call just before noon that something seemed wrong with the bridge, which officials say is about 30 years old. Town Manager William Sequino said the School Department and the bus company that busses local students had been notified. South Road is just south of the intersection of Routes 2 and 4, near Richard's Pub. It feeds the Woodland Greens Golf Club. Seeing that I live just one house down from this bridge and it is the route I take to get to the highway, it should be an inconvenience every time I go out. I knew this would happen after all of the trucks that were used to transport the hundreds of trees that were taken down last year by National Grid. I should have called the town and/or the state at that time so this problem could have been averted. My plan is to write some letters and see what can be done to get National Grid to pay for some of the repair.